Are you feeling lonely Wolf? It is half an hour since you posted and no-one has joined you. It must be sleeping in day for the regular Sudokuists. Good Maen, good people. I solved up 1-&GT;9 skipping 3,4,7 then filled the skipped three numbers in the same order to finish. ....About the photo: I hear that's what Michigan looks like right now. I'm still in Florida. Art Fair yesterday and today. -28.2C and falling - Brrrrrrr! 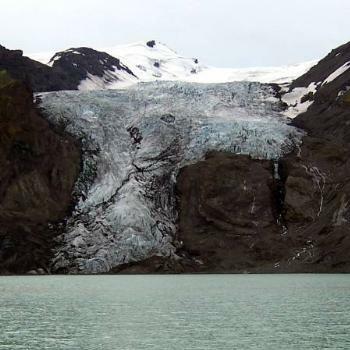 Can anyone else see the face with the lolling tongue on the glacier? I see a dog with its head out the window and ears flying back, Bev! 1:45. A late 'Good Mornings no to you all! Or perhaps a mountain lion, Bev and Judy? all. I see a dirty glacier. ... and apparently no 'Tough' today! I see a very sad platypus with crooked eyes and a broken beak. Morning all, looks more like a kangaroo to me. If you turn the dog sideways, you can see a very happy turtle! Even the sun is sleeping in this morning, it's still dark outside . It's usually lighter by now. Lovely, and unusual photo today. Good mAen. Yes Plum, that was a driveway yesterday in Illinois- now, it's 'winter Warm'. Was amazing how the weather was polar opposites on this site - hot as hell and cold as hell ! I see a frog head. I just noticed I have new personal smilies in my collection!!! I think it's been well over a year, maybe two, since I submitted them. to whoever finally got on the ball! We all need a good laugh sometimes!!!! I did not realize that clicking on Tough took me to Easy, so at first I thought, gee, this is an easy Tough! I got only one number into it before realizing I was on Easy. DoA - you always pick some good ones - that Groucho Marx bit was very funny - thanks! Enjoy the rest of the day, everyone! Found it, Wombat - thanks! 1:56 Good morning one and all! Not only does clicking 'Touch' today take you back to easy, it also logs me out! I also tried a the back door (going to yesterday's Tough and clicking next - same result). When I went to check the site out a short while ago, a message came up something about membership but I didn't read it. Now I'm in as a member but have all the adverts as if I'm not a member.